When I was a small child of Samburu culture, I had a father and a mother but my father got sick. At the tender age of 4, he passed away. I remained with my mom and started experiencing many challenges. The worst of all was when my father’s brother took everything that ever belonged to my father. Because he could not remove the house, he burned it down. We were left homeless and hopeless. My mother had two children and not a single coin or crumb of food to raise us. She was very brave and took my brothers and myself to a place 2 days away called Sekanani in the Maasai Mara. We started our education at a rural, impoverished day school, but continued to experience a lot of challenges even in that setting. Many were the days that we slept without eating anything or could not go to school because we lacked fees. The balance my mother was required to pay was 3,500 ksh which covered one term of my school fees. This was equal to about $35 US dollars. She was struggling to pay for my brother who was in class 8… I knew that I would have to wait. I wondered if I would even be able to go to school again. When my brother finished his 8th grade studies, some visitors came and played baseball with him. It was a big number of people but he excelled at the game and managed to win. That visitor took him and sponsored him. Our family was so happy for him. He continued with his studies until Form 4 (senior year of High School). During that time, I myself was in class 7. I managed to attend class here and there but I missed more days than I attended because of fees. I happened to be in school on a day when an angel from heaven came to visit my school with Matanya’s Hope. Our teacher told us to present songs, poems and dancing for our visitors. I presented my composed poem called GIRL CHILD. Then, my special angel, Ann, told me that she wanted to sponsor me. That moment was like a dream. I could not believe I would go to school and my mother would not struggle again because of my school fees. My mom was very, very happy because of the sponsorship as well. I quickly joined boarding school where I was able to focus on my studies. Although I did my national exam, I did not manage to attain the marks which would qualify me for a good school. This is because I did the exam only shortly after I joined boarding school and because I was living in an area where education was not strong. 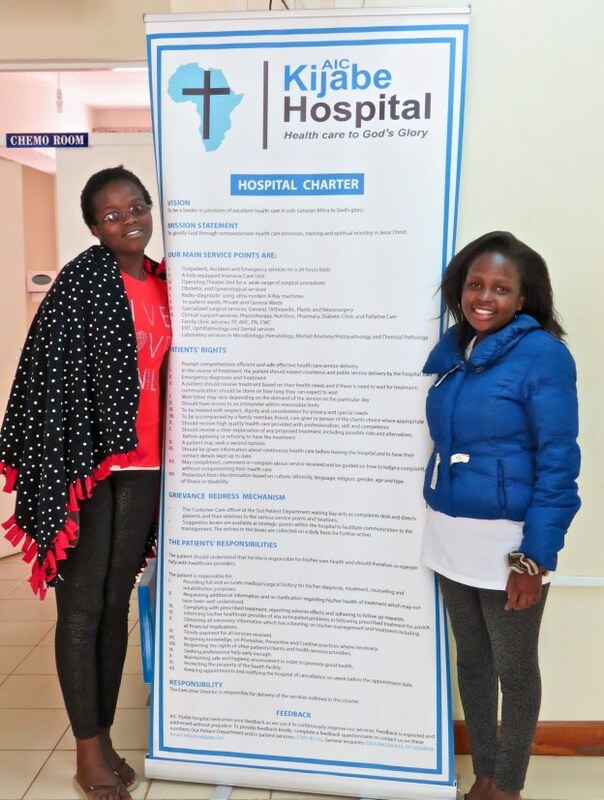 Matanya’s Hope encouraged me and said that I could repeat my 8th grade year in a top Kenyan school in Nanyuki. Although the idea of repeating was very difficult for me to accept at first, I knew that Matanya’s Hope was offering me a chance to succeed in my life. Without repeating, I would not have that opportunity. I am preparing to finish my 8th grade year this November and I am more confident that I will succeed since I can see with my own eyes how much my grades have improved. 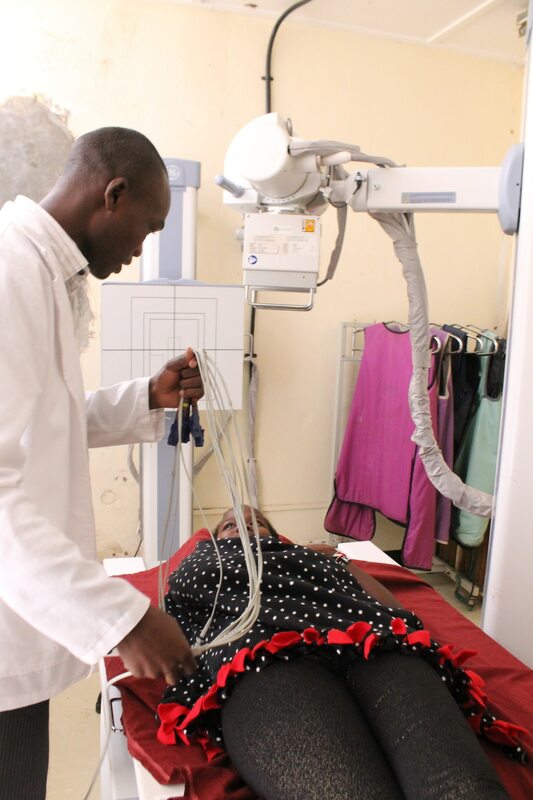 Me having an EKG at Kijabe Hospital. Matanya’s Hope has encouraged me in every way. When they heard that I had been experiencing fainting spells, they came from USA and took me to the hospital for full evaluation. I don’t know what would be if they did not come into my life. Whether it is my health, my emotional well being or my education, they have been by my side through it all. I want to be a surgeon. I pray that one day I will be able to give back to others the way that Matanya’s Hope and my special angel have given to me. This entry was posted in MISSION 2015 on July 11, 2015 by Michelle Stark. My name is Jonah Blumenthal. The last time that I was in Africa was 10 years ago when I traveled with my family to Kenya on vacation. There, we visited Matanya Primary School, an impoverished community elementary school. Today was the first time that I have been back to Matanya. It is not a coincidence that today was also the first time that I have cried in close to a year. Early this morning we began our day by serving the students of Matanya Primary School their daily allotment of porridge. Many of these children count on their one cup of porridge (made daily from freshly milled amaranth, sorghum, millet, finger millet and maize) to fill them up enough to stay in school. Without their porridge, many students miss school due to hunger. This was not the reason that I wept. It was only after meeting Nancy Wangui that I began to become emotional. I was handing out shoes for those students in need, when my Aunt Michelle called me over. I nonchalantly walked over to Michelle to find Nancy quite, and afraid. I was introduced to Nancy because we both wish to become Surgeons. Fortunately, Nancy was willing to open up to me and was brave enough to share with me her difficult history. Nancy explained that when she was seven years old, her mother passed away. Thus, she was left with an infant brother and a father. Unfortunately, her father was (and continues to be) a drug addict who physically abused her and forced her to act as a seven-year-old mother to her infant brother. Nancy had only an aunt (who has five kids of her own) to turn to for help. The rest of her family wanted nothing to do with her. Unfortunately, her aunt could not afford the miniscule payment required to keep Nancy in school. She was sent to an orphanage. It closed. Nancy then found her way back to her aunt’s house where she now lives and attends Matanya Primary School. Unfortunately, due to her aunt’s inability to afford her education, Nancy is constantly sent home due to a growing debt owed to the school. Now that Nancy resides at her aunt’s house, her afternoon routine is no easier. After walking home from school, she must walk three kilometers to fetch water from the river. Each bucket of river water she collects weighs around 20 Kilograms. After making her journey back home, she must find firewood and help prepare food (if there is to be anything to eat). Only then at dusk, may she begin her homework. Nancy then must struggle to see her schoolwork through dim light off of her Aunts most basic cell phone (if it is working that day). Now, what makes Nancy special is not just that she has and continues to face difficulty, but that she has the second best grades in her school. Through all of her struggles, her forced absenteeism’s due to lack of school fees, her drive to become educated and to better herself has persevered. Now is when she needs help. Nancy needs support, or she will just be kicked out of school. It was at this point that Lillian, Quincy, and myself decided to pull together enough funds to buy her some time as we search for a sponsor. She is a very bright and determined girl. You can feel it when she speaks. When she says that she will be a surgeon, so that others will not suffer and die like her mother, you know that if given the opportunity, in 12 years she will be Dr. Wangui. Unfortunately, right now her education will end in November unless someone intervenes. If you have the means, please help keep Nancy in school and support her goals of becoming a Surgeon. Help us tell her that there are people out there who care about her. This entry was posted in MISSION 2015 on July 7, 2015 by Michelle Stark. This is Quincy writing—the seemingly random West Virginian who somehow found herself on a plane to Africa on Tuesday thanks to her friend Jonah (he’s probably writing the other blog… if not, I promise he’s a cool guy). Some background about me (ew I hate talking about myself): I’m super funny, I’m pretty cool, and my favorite color is yellow. Just kidding. But yellow really is my favorite color. As I already said, I’m from West Virginia, but I met Jonah at Brown University where we’ll be sophomores next year. I play rugby, study mechanical engineering, and love to travel. This is my third time in Africa, my first being two years ago to Kenya and Tanzania, and last year I went to Morocco. As you’ve probably already learned, I’m a fairly terrible writer, and I feel bad for Michelle who has to fix all my awful grammar mistakes and poor attempts at making jokes. Now that introductions are finished, let’s talk about this trip! A trip where I’ve learned very quickly that “Anything you want to happen fast, expect to happen slow, and anything you want to happen slow, expect to happen slower” (as said in the wise words of Michelle). Do you want to hear the good news or the bad news first? Well, I choose the bad. (If you want to skip all the details, start reading at **HERE** below). Kenya seems to have some problems with their delivery companies (UPS or U-haul should look into staking some business here because Kenya is in DESPERATE NEED). Our boxes (well not my boxes per se, I mean the nearly 2000 pounds of donated goods that Michelle and Ann put together) that were sent to Kenya at the end of March are MIA (well, maybe not technically missing but they’re about a month behind schedule). A recipe composed of a dash of ocean storms, a pinch of Kenyan time, 2 tablespoons of promissory notes, and a cup of miscommunication have created a giant headache for everyone on the trip. Our entire mission depends on these donations (we only have about 10% of what we’ve gathered), so we’re searching for solutions. You need my passport so I can buy a phone from a chemist? Another “small” speed-bump—actually, speaking of speed-bumps, I have yet to see a speed limit sign, but the giant speed-bumps and omnipresent police checks ensure “safe driving”—on our journey is a three-day ongoing process to acquire a working phone. 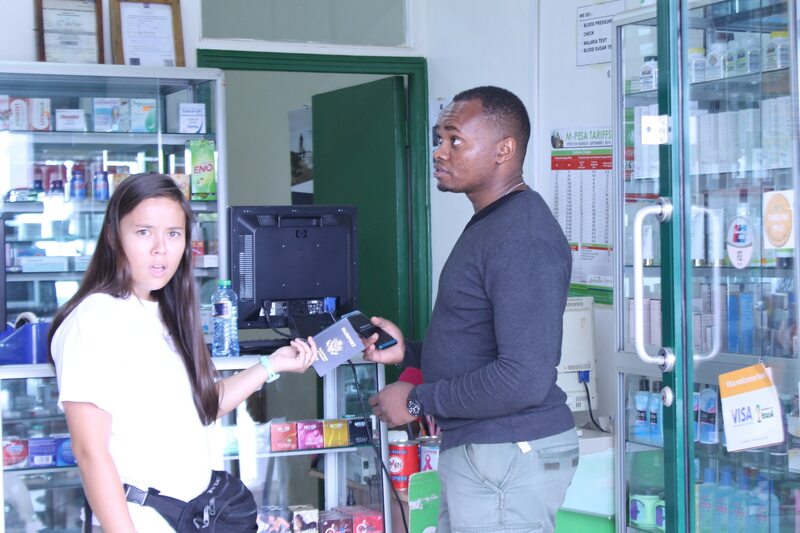 A cash-only phone deal at a sketchy Nairobi gas station and several shop visits in Meru, including an hour spent at the Chemist (which is a pharmacy, but also specializes in phone activation and Trader Joe’s vitamins which should be refrigerated, but are sitting out on the shelf. If you want any, I’m sure I can get a good deal) have produced nothing more than two cell-phone shaped paperweights. Our car also has a broken alternator. Do I know what that is? No (thanks for teaching me nothing about cars, Dad). Does it sound terrifying and trip-delaying? Absolutely. **HERE** In short, we have next to no donations, we can’t call home, and our car is about to ready to keel over. Yay! On a lighter note, some things are looking up. We bought towels yesterday, so I (finally) bucket showered this morning. For those of you who don’t know what that is, it’s where you boil a bucket full of water and mix this hot water with the freezing cold tap water in a basin. Then you just kind of splash around with soap and water and somehow emerge clean, at least…relatively. I’ve met some awesome, awesome, awesome people, too. Lillian was the first, a giggly, talkative young girl who’s going to be a high school senior in Albany, Georgia in the fall. She wore a coral pink prom dress this year, has an Instagram account called lillykenya, and wants to be a doctor. Oh and she was born into abject poverty in rural Kenya. When Lillian was 15, Michelle brought her to the United States to live with her sponsors and go to an American high school. I’m struggling to find the words to describe how beautiful, humble, joyful, caring, and thoughtful she is. She’s independent and can be feisty, but maintains an air of strength and modesty that illustrates a maturity and worldly understanding that I’ve never seen before. I’ll meet her grandmother in Karatina (the place of carrot-colored soil) next week and watch her graduate high school in Albany next spring. The first day, I also met Mercy, Solomon, Lawrence, and Vincent. The four of them are sponsored college students, Jonah’s family being the one to sponsor Mercy for the past 10 Years. She studies food science, while Solomon is studying to become a teacher, Lawrence studies computer science, and Vincent studies economics. It happened to be Vincent’s birthday the day I met him, and I watched him kiss a giraffe for the first time and receive a laptop from his sponsors. 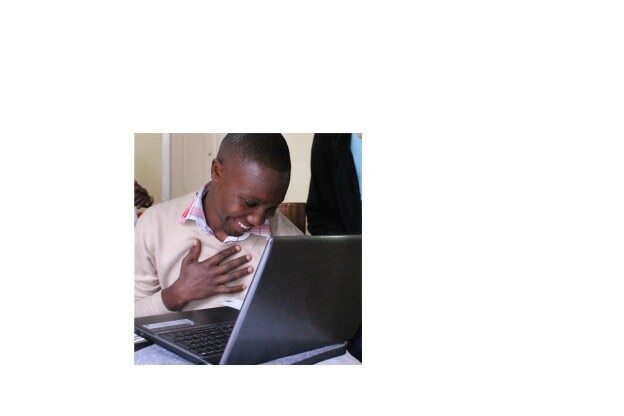 I also watched Solomon receive a laptop earlier that day. Their reactions were of such gratitude and speechlessness, that I’m having trouble describing it. You’ll have to see it for yourself because it is beyond humbling. Jonah took Mercy grocery shopping, while Michelle took Solomon. I write this feeling guilty because food is honestly a struggle for these students. When I go eat at school, it’s a question of where, what, and how much. For them, it’s a question of if. They can’t afford to spend 300 Kenyan Shillings, less than $3.75, to eat dinner some days. Lawrence and Vincent (brothers) lost their dad in January and had to call on friends to find a place to live. Lawrence currently lives with Michael, our guide, because he can’t afford anywhere else. I was complaining I was going to have to live with a roommate in April. But I never would have known any of this had they not told me. They smile constantly and answer questions honestly. They speak English, Swahili, and a variation of dialects. They’re well versed in math, chemistry, physics, and a slew of other subjects. They don’t want my sympathy or anyone’s for that matter, they want respect. They want to make something of themselves. They don’t want their children to be born into the same situation they were. They work harder than I do because this is probably the only shot they’ve got. If I flunk out, I can go back to West Virginia, fall asleep in my big bed, and work on applying to another college or job. If they fail…well, that’s not even worth mentioning because it’s not going to happen. These people are amazing. While the pace of this country is frustrating at times, the people are sincere and grateful. While I expected to be sleeping on dirt floors and longing for a shower, we’re sitting at a nice restaurant in the middle of Meru sipping on some vanilla milkshakes surfing the interwebs. 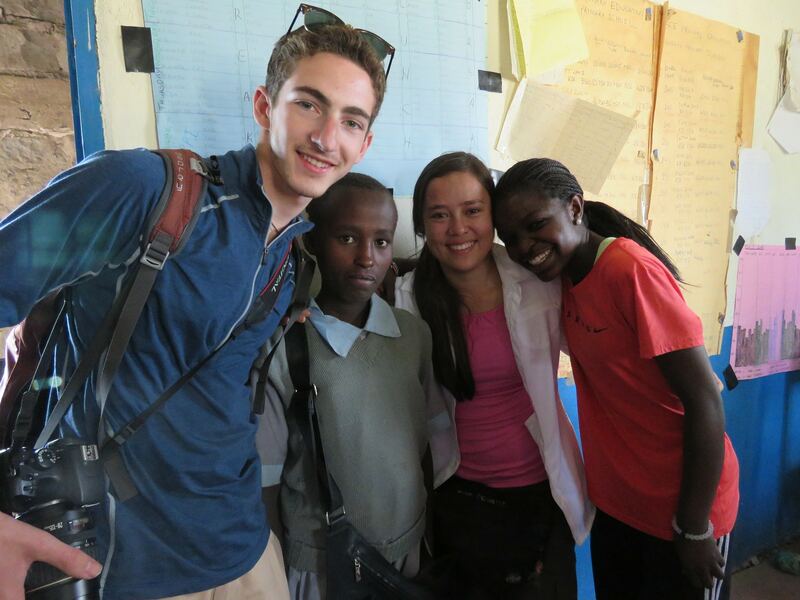 I can’t wait to see what the rest of this trip has to offer because I can learn so much from Kenya and its people. This entry was posted in MISSION 2015 on July 4, 2015 by Michelle Stark.